The Finnish metal cellists are back with a new album, “Shadowmaker”. After 22 years, Apocalyptica have made an album as a band in the ordinary meaning of the word. The reason behind this is pretty easy to see, or at least contemplate; they started off as a cover band and developed to do one incredible project after another with several famed, and above all, talented guest-musicians. Later they added drummer Mikko Sirén to their band. However, Franky Perez (former guitarist of “Scars on Broadway”), is the newest addition. Cellists Eicca Toppinen, Paavo Lötjönen, Perttu Kivilaakso and drummer Mikko Sirén are still the real core of the band, but with Perez, they got a singer for the whole album who will also perform on their shows to come. Band leader, Eicca Toppinen, explained the change with the fact that “Having guest vocalists come in and do things in the past has been a lot of fun, but sometimes it means you can lose a bit of focus when you’re in the studio. “Shadowmaker” is a solid, kind of “normal” and unsurprisingly very professionally produced album. As far as the structures of the songs go, there are sometimes elements that were already present in their previous albums, but staying true to your sound and making entirely new riffs, rhythms and chords is impossible if you’ve been doing what you do as long as Apocalyptica. The major change in this album is the very American style in some of the songs, which might be influenced by their new singer. Some songs, like “Cold Blood” – which comes right after the really amazing intro “I-III-V Seed of Chaos” –, as well as the title track “Shadowmaker” and “Slowburn” are very much focused on vocals and drums; furthermore, the cellos don’t really come out like cellos and could have easily been guitars. Surely there are the cellos, but they appear more like additions to the songs, whereas usually they are the core of all songs. Those tracks could be easily from any other US-Alternative-Rock-Band. The slower, ballad-like songs “Hole in My Soul”, “Sea Song” and "Dead Man´s Eyes" are a bit boring as the moody, melancholic feeling the band probably intended to create wasn’t really unfolding itself to me. Luckily this is not the case in all of the pieces of this album, as there are real old school Apocalyptica tracks in their instrumental tracks, like “Reign of Fear” and “Till Death Do Us Part” – the deepest, strongest and most soulful song on “Shadowmaker”. Those two are amazingly arranged and make their way from ear into bloodstream and to legs and neck. One more instrumental song is “Riot Lights” which confuses with almost Trance-/Europop-ish-beats and feels completely out of place. Now, if you got the impression, that only the instrumental tracks are worth listening, I have to add that Perez and Apocalyptica are doing a pretty fine job on “House of Chains” and “Come Back Down”. I don’t know if Perez is now a permanent member of Apocalyptica, but if this is the case, there would be a fair chance that fans could get bored with his voice after the next album. Don’t get me wrong, his voice is good and got enough variety in it to fill this position on “Shadowmaker”, but having this one singer on all upcoming albums, would limited the genius of this band. If they take a new singer for every album – that would be something more promising. But who knows what the future will hold for Apocalyptica-fans. Five very strong songs and one great intro are reasons enough to recommend listening to “Shadowmaker”. The rest is, why the album couldn’t get more points. I can still remember Eicca Toppinen´s statement from about ten years ago, as he was fully convinced that the band´s music does not need a permanent singer and that the majority of their songs would always be instrumental. 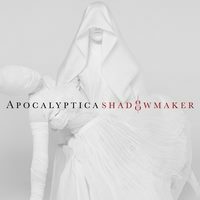 How much a decade can change things is obvious with this album, as Apocalyptica´s latest output “Shadowmaker” consists mostly of songs on which the cellists have collaborated with singer Franky Perez. The opening of the album is kept instrumental, nevertheless – the starter “I-III-V Seed of Chaos” is actually not as chaotic as it might sound, and it is also not a forerunner for what is still to come upon the listener. What follows is no longer merely instrumental, because Franky Perez is giving his best - songs such as “Cold Blood” or “Shadowmaker” had already been presented to the fans before the release, functioning as teaser songs. And those two had clearly been chosen being among the strongest songs of this album. Powerful vocals, a nice and catchy cello melody that sticks to the mind and an overall matching sound. “Slow Burn” starts with the sound of picked cello strings, yet grows stronger really fast and turns into a full picture of cellos and drums - before also the vocals start and make it a full and coherent sound. A conjuring voice, and this one can easily manage to “put a spell” on you if you just let loose for a while and close your eyes. The chorus is more rocking than the verses, but nevertheless fits well into the song, there are no breaks or harsh transitions. One of the few moments of a rather traditional Apocalyptica sound is provided with “Till Death Do Us Part” - though it´s clear that their sound has developed and also changed: longer songs that keep on changing within and a lot of different musical aspects, lacking that certain “red herring” and rather offering one with colors continously in transition. But this is exactly what makes this song worth listening to - the many sides and the diverse sound. At the end of the album you can find my very personal highlight - “Dead Man´s Eyes” . That song goes straight to the heart. A very melancholic mood is created, quiet melodies and a fragile yet expressive singing. Instrumental passages in between the parts of the song manage to keep up the mood and put some more thoughtful sounds even on top of it. In course of the song, the melancholy nearly turns into a painful desperation, and this is also pictured by the musical changes from the soft and quiet to the stronger and louder tunes. The only downside of this song is the far too long finale, as it adds nothing to the song anymore. It can clearly be the case that many Apocalyptica fans from the old times will need to get over their initial shock when putting the CD into their player - because it clearly is nothing like the pure cello sound anymore. Also statements like “That´s more like Franky Perez feat. Apocalyptica” are understandable, because this is how it felt to me at times too. Nevertheless, and no matter how you call it, this is a harmonius album full of strong and convincing songs, thanks to which you can hear how much commitment was invested into them.